Tom: Welcome to the podcast. 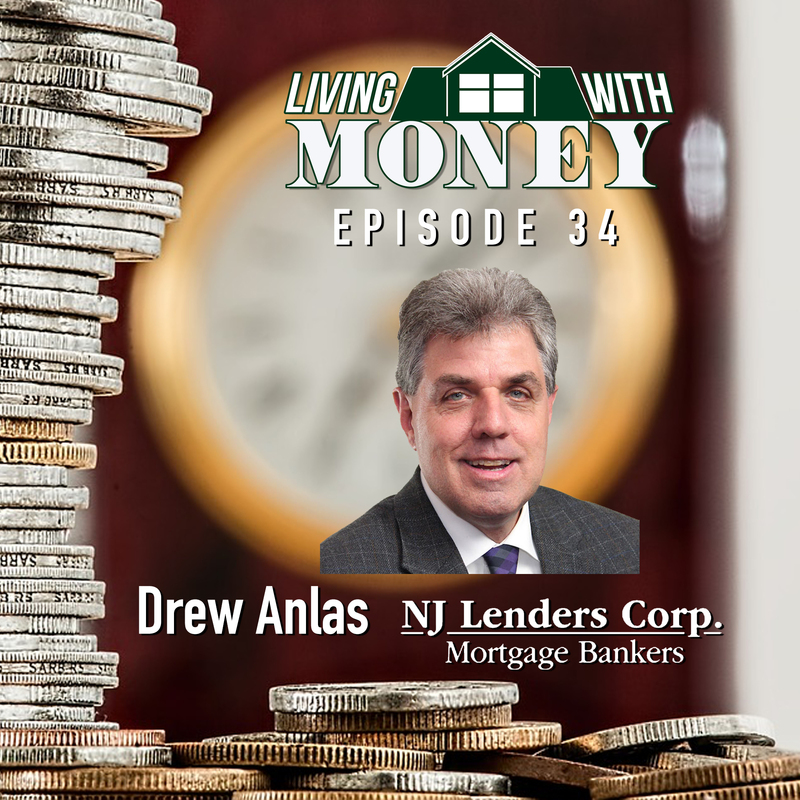 Today my guest is Drew Anlas. Drew is with NJ Lenders. Drew, welcome to the podcast. Drew Anlas: Thank you, Tom, and thanks for having me today. I appreciate it. Tom: Let’s start out and tell us what you do, and then we’ll get into a little bit of history. Drew Anlas: Yes, Tom. I’ve been a mortgage banker for 34 years now. I started on Valentine’s Day in 1984 for a now-defunct bank called Shadow Lawn Savings and Loan, where I learned the trade and moved out on my own in 1987 and I’ve been doing it ever since. Tom: Wow. So you started working in a bank and now you’re with NJ Lenders, which is a mortgage broker. Tom: Okay. Explain so we can understand a little better, because you’ll find mortgage people that work in a bank and then you’ll find mortgage bankers and mortgage brokers. Can you shed a little light on the differences? Drew Anlas: Yeah, and that’s a very important question. I get asked a lot, difference between, especially between a mortgage broker and a mortgage banker. The difference between a banker and a broker is a broker cannot issue their own commitments. They do not lend their own funds. They’re brokering to a third-party source to do basically all of the hard stuff. They do the processing, but then they rely on outside bank underwriters, other banks to supply funds, et cetera. As a full-fledged mortgage banker, you can originate, approve, close all of your own loans, which is what we do, using bank warehousing lines. So when we close a loan and then we sell a loan, we’ll replenish our warehousing line so we can lend again and again and again. So a bank is just whoever they are. They’re a lending source for whatever loan products they have. As a banker, we can sell to 45 to 50 different lending sources around the country, therefore giving the customer the ultimate opportunity for product, rate, et cetera. Tom: So that also gives you a lot of flexibility. If you’re trying to help someone get a mortgage and it doesn’t go through, what you would think a traditional channel, you can go elsewhere? Drew Anlas: Yes. And it’s important, our underwriters and our loan officers have to know the guidelines and the rates every day of over 45 to 50 different lending sources. So it is challenging, because you do not only have to know one product line, you have to know 45 or 50 product lines. But as I’m sure you in the financial world in insurance, it’s similar to that, where you have access to a lot of different avenues to go, so an advantage is being able to help a customer if they’re not fitting inside the box 100%. Tom: There’s a lot of moving parts there. Drew Anlas: Yeah. I relate getting a mortgage to putting a jigsaw puzzle together, and the jigsaw puzzle, you’re missing that one piece and you’re sitting there fighting trying to get a loan approved or closed and you got to find that missing piece. So when you go to a one-dimensional source, if you’re missing that one piece and you can’t find it, you’re done, where we can maneuver and try to figure out the best way to get the loan approved and closed. Tom: Alright. So walk us through your history. So you started with Shadow Lawn back in the ’80s. How did you get from there to here? And the reason for that … Because I don’t know if you know the life of a surveyor, especially back in the ’70s and ’80s, there was a lot of vacant everything, vacant land, vacant housing, so we were kind of always out on our own cutting through woods and lines and putting housing stakes in, and it was very lonely, and it was not my personality to be all out there by myself every day. So that was how I got in the business, and Shadow Lawn just happened to be there for the first three years of my career. Tom: So how did you then … walk us through from Shadow Lawn to NJ Lenders. Drew Anlas: So after I was at Shadow Lawn for a while, I realized I was not meant to be working for somebody. I was not a person that liked to be told what to do. I liked to kind of run my own show. So in 1987 at the age of 26, I went out on my own as a mortgage banker, got my license, opened up my own company, started doing bi-weekly mortgages. And I enjoyed that for about 10 years. I had three kids over that 10 years, and then I merged with a company called Select Mortgage in Brick, who’s no longer in business, in 1997. From there, I went to Mortgage Master in 2010, and then NJ Lenders three years ago. So always kind of pushing to see if I can get in a position to help more people, whether it be salespeople of my own or customers. Tom: So when I think back to what interest rates and what real estate, what the real estate market was around here was like in the ’80s and then through the early ’90s not so good, and then through the last decade, going back 10, 12 years ago, crazy. What was your perspective being on the ground level? Drew Anlas: Yeah. Well, first off, I’ve been in the business 34 years now, so I’ve seen every cycle imaginable. Tom: A couple of times. Drew Anlas: So it was a wild time, and the irony, though, is when you look at the affordability index, which, in the financial world we’ll notice right away, is it didn’t seem that challenging, even with the rates that high, because property values, property taxes, insurance costs, everything was just so cheap, I think my average loan amount in the ’80s when I started was only about maybe 50 to 75,000 as an average. So now it’s like 300,000, so it’s quite the difference. Tom: We’ve seen these slumps, I know, ’91, ’92, the market really slid here in New Jersey, and then it started to come back pretty nicely. It seemed at least on the other side pretty steady through the ’90s as the market came back. But what happened in 2003, ‘4, ‘5, 2006? I mean, things just kind of went crazy. Drew Anlas: Yeah. What happened is in any good market when you want to recover, you want the availability of credit to be there, and the problem was when the sub-prime mortgages and the alternate mortgages came out, they started offering them what a lot of normal underwriting guides, things that made sense, we would look at and say, “All right, the no-income verification loan,” when it first started, it was for people that were self-employed that had 30% down and excellent credit. Well, then what happened is the banks and Wall Street, the secondary markets, everybody started seeing that it was very popular and they started getting involved in creating different ways of putting these loans together. Right before the actual sub-prime crash, I remember one loan I did vividly, because I looked at it and said, “I just can’t believe that the bank is allowing us to do this,” it was basically a no-income verification loan, an 80/20 split, which meant it was an 80% first mortgage and a 20% second, 100% financing, and it was a no-income verification done strictly off of bank statement deposits. And the credit score was in the low 600s, which at that time was very low. So we started seeing it very obviously. Our underwriters would come to us and say, “Can we do this?” And we’re saying, “They’re buying it. We can do it. It’s approvable. It’s doable.” So even though we knew at the time it was not a good loan, it was still available. And as our job as mortgage bankers is not to tell people we can’t do a loan, if there’s an avenue and it’s an option, we have to utilize it. We can’t say, “We don’t like it. We’re not going to do it.” It was available. So the mortgage bankers after that crash really took a brunt of backlash of what happened, like, “We made these bad loans. We did it.” And it really wasn’t the case. We were doing what was available to us, and the crash was just basically a compilation of too many things all going wrong at the same time. So it was unfortunately in it was obvious that we could see it coming, but nobody put the brakes on. Tom: Fast-forward now to the last five or six years, you hear a lot of times that, “Oh, I can’t believe all the hoops I have to jump through now to get a loan,” it seems like the pendulum has swung the other way. Has it really? Drew Anlas: That’s a yes and no. It has in a fact where you have to be worthy. People got lost in 10, 12 years ago in the fact that you could say, “If you can fog a mirror, you can get a mortgage.” You always heard the story year after year about the cleaning lady that claimed no income and got a half a million dollar loan. I think the government used that as an example in their testimony. But the good news about it is if you are worthy, there are loans anywhere from zero, three, five percent down. The big misconception is you need 20% down to get a mortgage, and that’s definitely not true. Like I said, depending on what kind of loan, where you’re buying, we have loan offerings as little as no money down. But again, now you have to be able to qualify. You have to have a job and income and good, decent credit and money. So it is just common sense. Tom: You can’t just fog a mirror now anymore. Drew Anlas: You can’t just fog a mirror. But again, logically, it’s the way it always should have been. As a lender, you look at it and say, “All right. If everybody had just used common sense the whole way through, it would have never taken the turns that it did,” because you would have just said, “Is it a good loan or isn’t it?” But the problem we really see now, Tom, is the automation. The automation is dictating whether or not we make a loan. So we’re not using manual underwriting at all anymore. Nobody does. So when you look at a loan, it goes through an automated approval system. So if the computer says you can do it, then you can keep moving forward. If the computer says no, you have to figure out why not and see if you can get around that or just deny it. Tom: Here’s a good story. Drew Anlas: … I’m going to lend you …” and that I miss, because it doesn’t matter what your story is anymore, if the computer says no, it’s no. Tom: That’s very interesting, because we’re seeing the same thing happening now on the investment side, where models get put together and there’s really no room for a stock or an investment with a good story. So much like what you’re saying, if someone has a compelling story but they may not have the numbers to add up, the computer’s really boxing them out. Drew Anlas: Yeah, and that’s what I don’t like. And it is, it’s happening across the board, insurance, finance, mine, yours. It’s just a matter of right. Everybody has to fit in the box. And sometimes you know something makes sense or it is good and it doesn’t fit in the box, and that’s what I miss, and that’s when I think this market will really rebound again. Right now it’s hot because the rates are still very cheap and people can still afford things, but I think if the rates do go up, again, I said before, availability of credit is more important than interest rate. I really believe that, because you can always get a mortgage with a lower rate by taking an adjustable or something not that risky, but if you shut people out from borrowing, it doesn’t matter what the rate is if they can’t borrow. Tom: They can’t at any rate. Drew Anlas: Yeah. So that’s where I think the next big thing will come. If they can just get back to a little bit more common sense when they create loan programs, give us something to work with for people that are not 100% inside the box. And if you say, “Hey, it’s a good loan,” then it should be a good loan. It shouldn’t be debatable. But right now, it is. Tom: So I’m curious, how does someone like Drew Anlas … You’ve been in the business now for so long, where do you get your business from? Drew Anlas: I do a year-over-year analysis, and we do little or no advertising, so it’s basically customer referrals and repeat customers equate to at least 50% of my year-over-year business, real estate agents, attorneys, financial planners like yourself, whoever I meet that can be a referral source. So I’m not out there trying to compete against Rocket Mortgage, against any of these other places on TV. We don’t have million-dollar-a-month budgets. But we do have very good reputations. My partners and I and the people in my company all have over 30 years each experience. Our staff is accessible. When you call my office, you want to talk to a processor or an underwriter, you actually get them on the phone. And the big difference between what I do and a lot of the other clients is, you’re in a bidding war, which, there are a lot of bidding wars going on right now for purchase of a home, you need a preapproval on a Sunday night at 9:00 o’clock, you’re getting a preapproval from me at 9:00 o’clock on a Sunday night. So I don’t want to see any of my clients lose out on a possible purchase because we were just late to the game. That’s not going to happen. Tom: Yeah. That’s pretty good. If there was something that you could change about the industry, what would it be? Tom: I’m going to hit the pause button. What’s TRID? Drew Anlas: TRID is the replacement for the old Truth-in-Lending and the HUD disclosure. So when you apply for a loan and you’re getting the initial Truth-in-Lending, it isn’t a Truth-in-Lending anymore, it’s actually called a loan estimate. And the HUD-1 closing disclosure is now, the closing disclosure is not a HUD-1. So this only happened a couple years ago. They enacted it to help the consumers to make it easier, but in retrospect, it only added another layer of time management that you have to sit there and say, “All right, you need a rush close and we got to send out a disclosure. You got to wait 10 days.” So it really comes down to if I were to change anything, it would try to cut out some of that kind of stuff, the stuff that slows you down, that stops you, because a good loan should be a good loan. You shouldn’t need 20 other things to tell you it’s a good loan. It should be easier, and it’s not. And I don’t blame customers. That’s the first thing I tell them when I meet them, “It is a process, but if you help and you do X, Y, and Z, it will be a little more seamless than the horror stories that you hear.” So we do need a lot of help from our customers and our referral sources. Tom: I’m going to ask you what we were talking about right before we started the podcast. You’re online at the grocery store and the person in front of you is complaining about what a hassle it is getting a mortgage. What’s your intro? How do you break the ice? Drew Anlas: Yeah. My quick intro is just to obviously say, “Hey, I’ve been doing mortgages for 34 years. It’s not as hard as you think. If you have a minute to chat just so I can tell you how it can be done, that would be great.” Because it is very confusing. The data that people get on the internet, in your business, my business, people think they can go online, click a button and viola, they’re going to get an instant mortgage with a great rate. And again, we were talking about bidding wars before. You have to be ready in a lot of different ways. You have to be ready with the paperwork. You got to be ready emotionally to take the steps so when you’re in a stressful situation like buying a home and getting a mortgage, you’re vested, and you have to be ready for that. So some of the advice I give my people is, “Yeah, the process is going to be difficult. Are you ready for this step? Are you ready for this mortgage payment?” I don’t push anything on anybody that they don’t feel 100% comfortable with. And we kind of go over the psychology of it a little bit, as well, so they know what they’re getting into. Tom: That’s good. Let’s stay with this for a second. So is there a mistake that you see people making over and over that might stop them or be a stumbling block as they’re going through the process that’s something they might be able to avoid? Drew Anlas: Yeah. There’s a couple of things that I think are hot buttons right now that I think people give up on too easily. One is they think they need a lot more money than they need to go out and buy a home. Again, they hear the stories about 20% down. They think that they need their own money, but maybe they can get seller help or they can get family help, gift money from family. Also, credit. People run their credit and they think … some people with 700 credit scores, with 680, say, being an average credit score, they think it’s terrible, where people with a 500 credit score think it’s great. So not having advice. I think the mistake people make is they’re utilizing technology for both the right and the wrong reasons. They’re going on and they’re thinking that they know more than they do sometimes when they need an expert opinion to say, “Well, how can I improve my credit score three months, six months, a year from now, so I’m ready to get a loan? Or how much money do I really need to buy a home, either of my own or a gift?” So I think it’s just getting good advice and the right advice. Tom: And getting an answer right away instead of searching through pages and pages on the internet, be able to pick up the phone and talk to someone? Tom: Out of the blue, a question. If a recent college grad came to you and said, “I’m thinking about getting into the mortgage business,” what kind of advice would you give them? Drew Anlas: Wow, that’s a good one, because we’ve had this conversation at my office quite a number of times lately. The problem that I see as a problem is the ever-changing world of the regulations of the mortgage industry. Over 34 years of doing this, there isn’t a day that goes by that I don’t have at least one to two questions about something regarding to how to get a loan through or how to underwrite a file. So just the knowledge alone of what you have to know and the kind of expert you have to be in the field of mortgages right now is the only thing that would slow me down from hiring somebody brand new. You do have to be licensed now. 12 years ago, we talked about the dilemmas. The crazy part is you only had to be registered back in the day of the Wild West of mortgages. Now you have to be licensed. You’re actually going to have to take a certain amount of hours of education, take a test, pass it. So that is a process. So we try to bring the younger people in as trainees, as assistants first, while they’re doing all the education and the testing, and then kind of ease them in that way. But the one thing that I tell everybody immediately, no matter who they are, whether they’re new, old, whatever, is, “Who are your connections? Do you have contacts?” Because if you walk in and you say, “I got through four years of school. I was great. I had straight As,” I’m like, “Well, who do you know?” If they come back to me and say, “I know a lot, but I don’t know any real people,” they’re not going to make it, because you just need to have connections. You need to have referral sources that are going to be able to give you an opportunity to be in the game, to see if you can help people. Tom: Yeah. Hiding behind a computer screen doesn’t really help a lot of folks. Even today, you still need to have social skills. You’ve got to get out there and meet people and get to know them, work with them, and build a rapport and get a reputation. It sounds like you’ve been chipping away at that now for over three decades. Drew Anlas: Yeah. And I taught my children, who are now 26, 22, and 16, the same thing. As much as they are into social media, the one thing I told them to do at an early age was set up LinkedIn profiles, set up business profiles, so they’re ready when they graduate college with connections that are business-related. It’s great to Snapchat, Instagram. I know they’re all out there doing the pictures and whatnot, but from a sheer business point of view, if you’re starting your business thought process ahead of time, then by the time you’re actually ready to enter the business field, maybe you’ve made some important connections along the way. Tom: You and I have known each other now for a couple of years, but we’ve really gotten to know each other lately through the chamber of commerce. Do you want to spend a minute or two talking about your experience? Drew Anlas: Yeah. I’ve been involved with the chamber for about five years, so I very quickly went from being a non-member to a member to membership chair to president a very short period of time. And I think the reason for that is my business philosophy is just to try to help everybody succeed. If there’s a way we can help anybody, whether it’s a small local business selling groceries, plants, whatever, to financial planners like yourself, the importance about any good economy is the overall hull has to do good. One or two people do good and everybody else suffers is not a good economy. Drew Anlas: The more people you help succeed, the better the local economy, the better the local economy, the better the regional economy, and so on and so on. So I think my philosophy fit really well as a chamber of commerce member, so for me to escalate up to president I think was more over my beliefs of just I just like to help people, whether it’s a customer getting a mortgage, a business, involving them in the local community to enhance their business, it really is fun to watch people succeed. Tom: And not to turn this into a chamber of commerce commercial, but this chamber rocks. I mean, there are so many activities going on, so many opportunities to meet people and to network and to get to know everyone in the group. Drew Anlas: Yeah, and I thought that was really important, because we noticed over the last few years that the traditional chamber of commerce definition was a bricks and mortars group of people coming together to expand local businesses. But Tom, over the last two or three years, we’ve seen a heavy influx of home-based and small businesses enter the market, people that are leaving Wall Street and opening up home-based businesses, people that are working out of their homes that are maybe a one to five employee company that still needs help but doesn’t really know how to go about getting that help. So I saw a need not just to help the big companies, but also to take the local business owners that are trying to find a way and say, “Well, how can we get people involved with other people, bring them into a chamber event, make it a networking event so we can make people feel comfortable in a group of 40, 50 people so they can show how their business works and how they can move on to the next level of their company?” So again, it’s a very good feeling when you see somebody go from starting out to a success story. And it just makes everybody feel good that you’ve helped somebody along the way. Tom: That’s really great. Drew, this has been fantastic. Tom: We’ll put you in the book. Drew Anlas: I really appreciate it. Tom: Alright, Drew Anlas. How can people get in touch with you? Drew Anlas: You can reach me on my cell phone number any time. It’s (732) 977-2096. I do have a digital business card, so if you text me at that number, I can send you my digital card, which will give you the opportunity to click on to me via social media or email address. So again, I appreciate the time. Tom: Great. Drew, thanks very much.